Note: This entry is the first in a series of book reviews on works of use or interest for futurists, including books that address the future in general, specific future domains, or futurist practice and/or methodology. Adam Kahane’s 2012 work, Transformative Scenario Planning, presents a variant of Shell’s adaptive scenario planning methodology that seeks to “construct scenarios not only to understand the future but also to influence it” (Kahane xv). 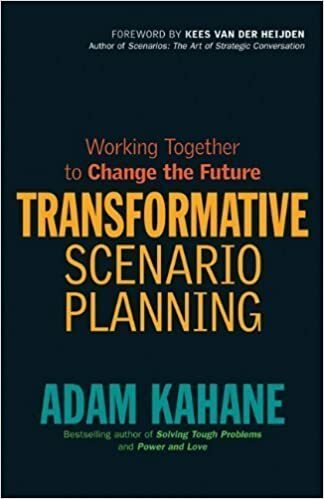 Throughout the book, Kahane outlines the genesis of the Transformative Scenario Planning methodology, details the process steps, and provides several specific case studies from his experiences in applying and refining the process. As emerges from the very first case study, that of the Mont Fleur project that Kahane led in South Africa at the time of the end of apartheid, the development of transformative scenario planning is designed for specific situations very different from its adaptive ancestor. In Shell’s adaptive scenario planning, the organization generally takes a reactive stance in that it views the environment as something to which it must adapt to the best of its ability, for the most positive outcome. Transformative scenario planning, on the other hand, looks at situations, contexts, or environments where several actors are stuck, to use Kahane’s word, and must work together to find their way out. Finding the way out means transforming the environment, not just adapting to it. “These people see the situation they are in as unacceptable, unstable, or unsustainable” (16). “These people cannot transform their situation on their own or by working only with their friends and colleagues” (16). “These people cannot transform their situation directly” (17). The transformative scenario planning methodology assumes that a facilitated scenario creation process that brings together these stakeholders in the situation described above can help them transform their situation. Most of Kahane’s work involved political situations where getting representatives from various factions together can facilitate solutions and break through barriers. The big main idea here is that if you can get the right people together to build models of what could happen in their shared situation, you can empower them to actually shape their situation, and thus their collective future. The method here is to get relevant actors together to create shared scenarios though a series of workshops. The goals are to transform the understandings, relationships, intentions, and actions of the actors in the situation (Kahane 18). “A whole-system team of insightful, influential and interested actors” (19). “A strong container within which these actors can transform their understandings, relationships, and intentions” (20). “A rigorous scenario-planning process” (20). “Convene a team from across the whole system” (23). “Observe what is happening” (23). “Construct Stories around what could happen” (23). “Discover what can and must be done” (23). “Act to transform the system” (23). The first step involves starting with a convening team of 5 to 10 people, who select up to 35 leading actors for the workshops. The second, third, and fourth steps involve facilitated work over the course of three to four workshops over three to four days. Finally, the scenario team works on the fifth step in a six to eight month period after the workshops. Ostrich — No negotiated settlement. Icarus — Government’s policies are unsustainable. Flight of the Flamingos — All items positive (Kahane 9). Stimela/Locomotive (Disconnected, well-being) (Kahane 54). Other examples included parties after the Guatemalan civil war, aboriginal issues in Australia, and more. In general, this is a useful book in that it clearly outlines a process and methodology for doing a certain kind of consulting. While the case studies tend to involve very similar situations, almost all of which are political and related to developing countries, there are lessons to learn from the way the author applies his methodology. Specifically, Kahane’s emphasis on finding flexible and creative ways to engage stakeholders in their different points of view, such as taking field trips or “learning journeys,” or encouraging them to interact outside the formal workshop exercises, are particularly inspiring. Of additional interest, and an idea I think all futurists should always keep in mind for their scenario workshop methodologies, is this idea of creating the container (or productive space) for the workshop. Kahane explains and emphasizes this well, and points to the key components: 1) the “political positioning of the exercise;” 2) the “psychosocial conditions of the work;” and 3) the “the physical locations of the meetings” (Kahane 20). Another aspect of considerable potential value is Kahane’s emphasis on creating metaphors for the scenarios that emerge from the process. Some of the metaphors are engaging and because of their evocative nature, they tended to stick in the minds of the participants, becoming ideas that lived far beyond the initial scenario exercise. Several examples are noted above. In conclusion, the book is a great, easy, short read that provides not only a process for scenario development but that is itself a case study in a futurist developing and refining his own methodology to largely great effect in a particular specialty area. The political nature of Kahane’s case studies may not appeal to everyone, and the method discussion is rather thin, but again a professional futurist or student should be able to extract value here. Kahane, A. (2012). Transformative Scenario Planning: Working Together to Change the Future. San Francisco: Berrett-Koehler.